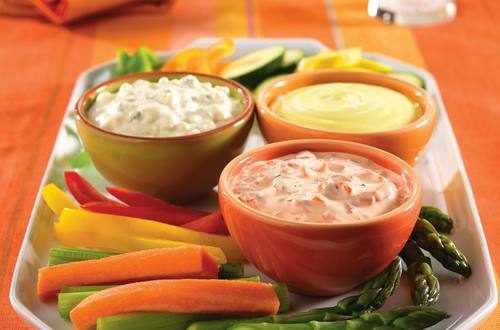 By simply adding just 2 ingredients to Hellmann's® Mayonnaise you can make these delicious dips! 1 Combine all ingredients in medium bowl. Great with fresh celery sticks, bell pepper strips or bread sticks. 2 For other great dipping sauces, try the following combinations. 3 For an ITALIAN DIPPING SAUCE, stir in 1 jar (7 oz.) roasted red peppers, drained and finely chopped, and 1/2 teaspoon red wine vinegar. Great for spreading on assorted crackers, thinly sliced Italian bread or fresh vegetable crudites. 4 For a WASABI DIPPING SAUCE, stir in 3 tablespoons prepared wasabi and 1 tablespoon milk. Great for dipping shrimp cocktail or spreading on roast beef or deli sandwiches for an extra kick! 5 For a BLUE CHEESE DIPPING SAUCE, stir in 1/4 cup crumbled blue cheese and 2 tablespoons milk. Great with spicy chicken wings and barbecued chicken or beef. 6 For a BUFFALO DIPPING SAUCE, stir in 1 tablespoon cayenne pepper sauce and 1 tablespoon milk. Adds great flavor to healthy vegetable crudites. Photo Copyright© 2009 Publications International, Ltd. Used with permission. Also terrific with Hellmann's® or Best Foods® Mayonnaise Dressing with Olive Oil.